Model Views provide an alternative view of the elements in the Repository. Whereas the Project Browser is designed to organize the packages and elements structurally the Model Views facility allows the modeler to create a number of views that can group elements and diagrams differently. The Project Browser has been designed to organize the elements structurally grouping elements and diagrams together into packages based on factors such as namespaces, type of element and the part of the process. 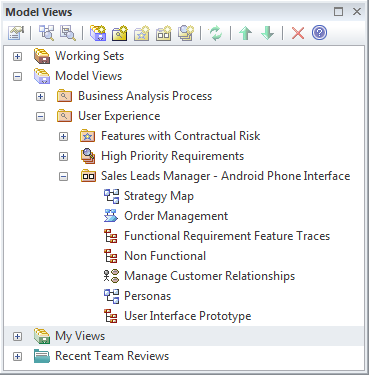 Model Views allow a user to create a structure based on a wide range of criteria including Favorites folders and folders based on a search such as all elements I created last week that have a status of 'Proposed'. Model views can be created for a variety of purposes and an experienced modeler will often use the Model Views facility as the access point to the Repository. The Favorites folder is useful to keep track of hand picked elements and diagrams of interest. The Slide show folder is useful to create a diagram slide show for the purposes of demonstrating diagrams to a group of people in a workshop or meeting. The Search folder is useful to keep track of elements that meet specified criteria and to be notified when new elements are added to the Repository that meet the criteria. The Model Views root folder defines views that every user can see, whereas the My Views root folder is only visible to the current user. Both these root folders can contain any number of user-defined folders down to two levels. User-defined folders under the Model Views folder can contain three types of view: Favorites, Diagram Slide Shows and views based on a Search. User-defined folders under the My View folders can contain only views based on a Search. The Model Views window provides a convenient toolbar for working with the folders and elements.